Build an eye-catching PC that's designed to stay cool while keeping noise to a minimum with the Dark Base Pro 900 rev. 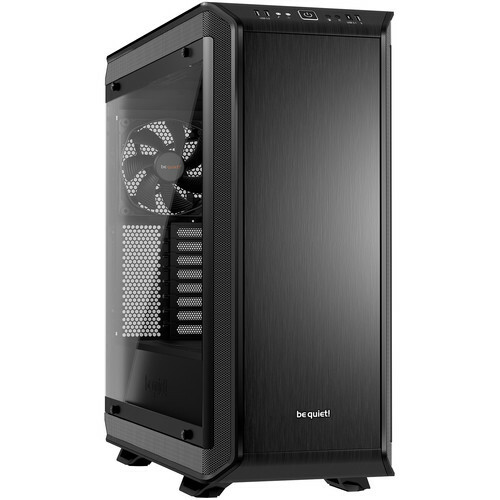 2 Full-Tower Case from be quiet!. Compatible with E-ATX, XL-ATC, ATX, Micro-ATX, and Mini-ITX motherboards, the Dark Base Pro 900 rev. 2 comes with two 5.25" drive bays, five 3.5" drive bays, and ten 2.5" drive bays. The black case has room for front, top, and rear radiators, and three 140mm fans are included. Noise-reducing vents help to ensure quiet operation, while a dual-rail fan controller lets you create two cooling zones that can be controlled using a front-panel switch. The case also features a tinted tempered-glass side window, internal LED lighting with six switchable colors, and an integrated Qi wireless charger. The decoupled motherboard tray adapts to suit individual requirements. You can adjust it to three different heights, install it alongside the left panel in an inverted layout with redefined airflow, or use it as a test bench. It is fully compatible with E-ATX and XL-ATX motherboards. The three pre-installed Silent Wings 3 140mm PWM fans offer virtually inaudible operation. They are equipped with a smooth-running 6-pole motor, a durable fluid-dynamic bearing, and airflow-optimized fan blade design. The frame has funnel-shaped air inlets that generate high air pressure. Drive bay installation options are flexible thanks to repositionable single HDD slots. Supports up to 5 HDDs, 10 SSDs, and 2 optical drives out of the box. The practical slot covers serve to hide any unused HDD slots and keep the inner workings neat and tidy. The PSU shroud offers a variety of solutions besides simply hiding the PSU and keeping the system tidy. The cover plates are separately detachable, making it possible to install a fan or an SSD on the top of the PSU shroud while leaving enough space for a radiator in the front. With its smart silence concept, the Dark Base Pro 900 rev. 2 is an ideal case for the requirements of overclocked systems and super-silent water-cooled PCs. It can carry up to seven additional fans, up to four radiators, and has noise-reducing vents all around the case that provide full-circuit airflow. The eight PWM fan connectors are divided over two rails, and each is switchable between Silence and Performance modes. This makes it possible to create two cooling zones that can be controlled using the front panel switch. If you want all fans to run at the same speed, you can switch both channels to the same mode. The case is equipped with a windowed side panel that is made of tinted and tempered glass. The eye-catching internal LED illumination comes in six switchable colors. You can position the LED strips freely inside the PC case. The front I/O port includes a USB 3.1 Gen 2 Type-C port, while an integrated Qi-enabled charger allows for wireless charging of phones and other compatible devices. Internal Drive Bays 5 x 3.5"
Box Dimensions (LxWxH) 26.7 x 26.2 x 13.0"